Safety footwear is part of the so-called Personal Protective Equipment. Safety footwear is part of the so-called Personal Protective Equipment, better known as PPE. This means that a worker's boots or shoes are obligatory when their purpose is to protect him or her from risks derived from his or her work, such as avoiding blows, cuts, slips or keeping him or her insulated from cold or heat. It is important to note that the law dictates that it is the employer who must provide their workers with these personal protective equipment and ensure its effective use, if the nature of the work requires it. In order to facilitate access to different models of quality safety footwear, Reysan offers both employers and workers an extensive catalogue that includes water boots, shoes for specific risks, safety boots against the cold and footwear for specific sectors, such as food or health. In short, shoes and boots that form part of PPE, defined in Ley 31/1995 de Prevención de Riesgos Laborales as equipment or accessories designed to protect the worker who wears them from one or more risks that may threaten their safety or health at work. Types of professional footwear: which one to choose? The safety footwear is characterized by providing protection in the part of the toes, so it incorporates a stop or safety toe that ensures sufficient protection against impact, with an energy equivalent of 200 J at the time of impact, and against static compression under a load of 15 KN. It also takes care of the protection in the part of the fingers by means of a stop or safety toe but with a protection against the minor impact. Specifically with an energy equivalent of 100 J at the time of the impact, and against static compression under a load of 10 KN. It is a footwear for professional use that does not provide protection in the part of the toes. They are, for example, many of the shoes of the sanitary or food sector, as well as those destined to the thermal isolation. In addition to these three types of professional shoes, the law also covers footwear and footwear for protection against heat or protection against cold, footwear against electricity, footwear for protection against chainsaws and safety shoes and boots. But how do you choose professional footwear for workers? To determine which shoes or boots to choose, it is necessary to take into account both the level of safety required by the worker and the comfort of the worker. To this end, studies and evaluations of the risks present in the workplace are carried out, trying to find a balance between both factors. Resistance of the tip of the footwear against falling objects or crushing of the front part of the foot. Capacity of the heel to absorb energy in the event of falls and impacts on the heel of the foot. Resistance of the sole to slipping with a reinforcement of the buttress to mitigate slip falls. Anti-puncture sole quality in case it is necessary to walk on sharp objects. Electrical insulation of the boots for low and medium voltage. Thermal insulation in work situations with excessive cold or heat. Resistance and watertightness for work in which there is a risk of projection of molten metals. Resistance and tightness for tasks in which they carry out chemical actions with aggressive powders or liquids. 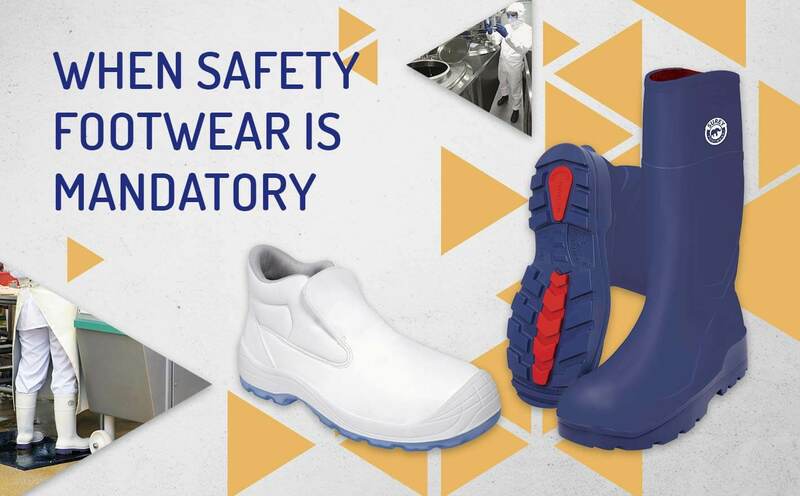 If you are looking for safety footwear equipment, we invite you to visit our section dedicated to occupational foot protection, where you will find everything from Dunlop or Panter boots to our own production, very affordable and of high quality. We look forward to seeing you!